“April 1, 2019, New Orleans, Louisiana, USA – A commemorative event was held at the New Orleans Sheriff’s Day Reporting Center for award of graduation certificates to the first batch of Anudip students who are under the city’s probation and parole system. There was much to celebrate as the graduating students (100% have secured IT jobs) and an incoming cohort of students were presented to Sheriff Marlin Gusman and Charu Adesnik, Deputy Director of Cisco Foundation. Cisco is the sponsor of Anudip’s New Orleans program. 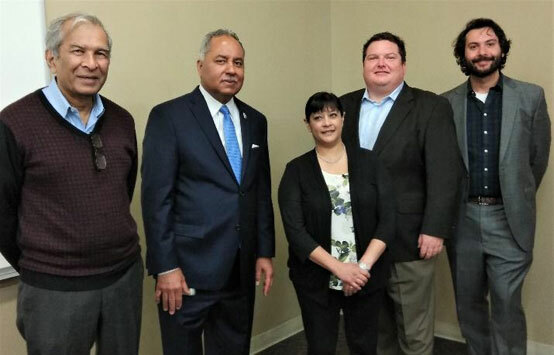 The above attached picture depicts (L to R) Dipak Basu, Anudip Director, Sheriff Gusman, Charu Adesnik, Jason Bargas, head of our New Orleans Operation, and Nicholas Simoneaux, Instructor, who received deep appreciation from his students at the event.